Elwood Gail Thueson, age 93, passed away surrounded by family on April 12, 2019. He was born September 9, 1925, in Nampa, Idaho, the oldest son and first child of Gail Hesse and Lela C. (Davenport) Thueson. He graduated from Franklin High School in Boise in the midst of WWII and promptly joined millions of others in the service of his country, serving honorably in the Army Air Corp until victory was achieved. Returning to Idaho, he quickly fell in love with a beautiful girl from Salmon, Idaho, who was attending the College of Idaho. He married her, our mom, Pollie Elizabeth Parmenter, on his birthday, September 9, 1947, in the Salt Lake LDS Temple. To this union, six children were born: Gail, Greg, Drew, Brad (deceased), Mary and Ann. After graduating from BYU, the couple farmed in Melba and later Kuna for several years. In 1957, the family left the farm and moved to Caldwell, where Elwood joined the Farmers Home Administration (FHA). This gave him the opportunity to assist other farmers with government loans and operating capital while better providing for his family. 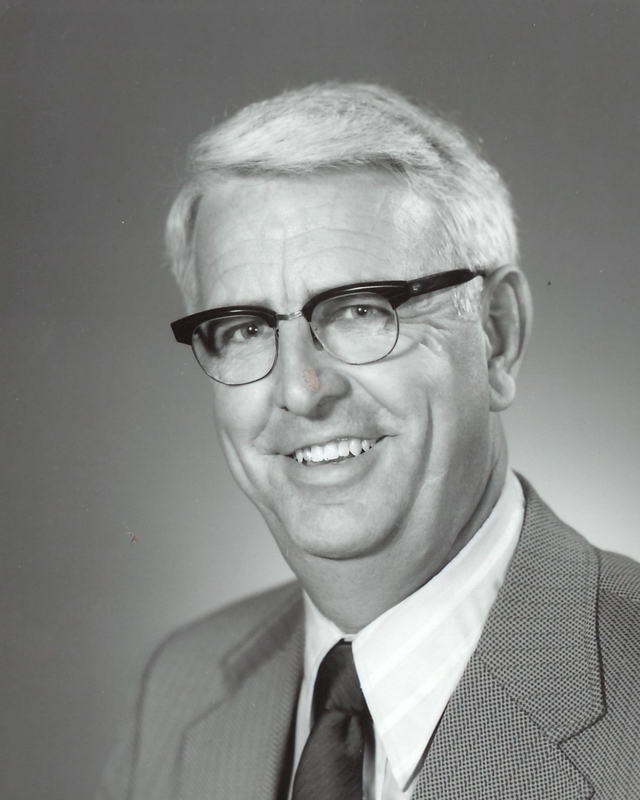 He became Owyhee County FHA supervisor in 1962, which took our family to Marsing. Later that year, he took over as supervisor of the Madison County FHA office in Rexburg, Idaho. Shortly after that move, youngest son Brad Lee was killed in a tragic accident. This trial only strengthened deep family bonds. Three years later, Elwood was transferred to the West Minidoka County office in Paul, Idaho, where he served for two years as county supervisor before being tapped to serve as head of the FHA’s Community Services Division in the state FHA office in Boise. Elwood was a pioneer in a relatively new type of FHA loan that assisted municipalities with water projects, grazing associations with operating capital and recreational loans. The Grand Targhee Ski Resort in Driggs, Idaho, for which he helped gain financing, was one of the first FHA loans to aid small Idaho communities with projects that provided more and better jobs, a broader tax base and recreational opportunities and growth. Always active in both church and community service, Elwood served as Bishop of the Boise 8th Ward, The Church of Jesus Christ of Latter-day Saints. He was diligent in many other callings as well, donating regularly in Red Cross blood drives, spearheading community improvement efforts and raising his children to be productive, contributing citizens. Elwood was given the opportunity to work in the national FHA office in the mid-70s, where he was also able to earn his master’s degree in public financial management from American University. Missing the countryside and farms in the West, he turned down opportunities in Washington, DC, and finished his career in the Denver, Colorado, FHA state office, retiring in 1984 as chief of community and business programs. Shortly after retiring and returning to Idaho, Elwood was tapped by Idaho’s governor to head the Idaho Farm Foreclosure Review Board, where he worked tirelessly to keep farmers on their land. Retirement also brought other opportunities for service. He and his sweetheart served the Boise LDS Temple for many years, organized family reunions and enjoyed kids, grand and great-grandchildren. Until ill health intervened, Elwood led numerous motorcycle trips into the backcountry, the first real hobby he ever really took time for. Sons and grandsons enjoyed his wisdom on these trips, bonding the family every more strongly together. Nor were his daughters and granddaughters neglected; they often sat on his lap as he navigated his riding mower around his 1-acre mini-farm or listened to his stories at frequent family gatherings. Dad’s life lost much of its appeal when Mom died in March 2014. By then, the couple were residents of Morningstar Assisted Living in Boise. Our sincere thanks to their dedicated and loving staff for making our parents last days so enjoyable. A public funeral will be held Friday, April 19, 2019, 10:30am, at The Church of Jesus Christ of Latter-day Saints, 6032 N. Five Mile Rd., Boise, with a viewing from 9:00-10:15am before the service. Interment will follow the service at Canyon Hill Cemetery, Caldwell, Idaho. He was a faithful disciple of the Lord Jesus Christ, a loving husband, devoted father, grandfather and great-grandfather. He loved his country, the Lord and all God’s children and creation. There's still time to send flowers to the Visitation at the Five Mile & Chinden LDS Chapel from 9:00 AM to 10:15 AM on April 19, 2019.